Not all art falls into a standard definition. The acclaimed and sometimes controversial work of contemporary artist Vincent Castiglia surely doesn’t. Vincent Castiglia paints surreal images in human blood. His haunting, beautifully surreal images portray human bodies and the human condition in abstract form. He began doing so as form of self-healing following a childhood of abuse and drug addiction. From darkness, however, came light, and Castiglia’s story is one of inspiration and hope, providing proof that art can heal and serve to inspire others. A world renowned artist who had his first exhibition hosted by the legendary art H.R. Giger, Castiglia tells all, including the reasons why blood became his preferred medium. Award winning independent filmmaker John Borowski (H.H. Holmes: America’s First Serial Killer) has directed and produced the feature documentary film which explores the works of Castiglia. 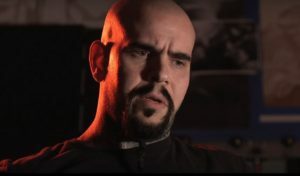 The film also delves into the process of how blood is safely drawn from the artist himself and his collectors, something Castiglia had to learn in the early days of the development of the unique art form. Margaret Cho, who commissioned Vincent to paint her portrait in her blood, is interviewed extensively in the film as are other celebrities including Gregg Allman (Allman Brothers Band), Damien Wayne Echols (West of Memphis), Kerry King (Punisher: War Zone) and Gary Holt of the heavy metal band Slayer, record executive Michael Alago, and numerous others. The film also includes great footage from the Switzerland studio and museum of legendary artist H.R. Giger, who designed the iconic creature for the Alien movies. Metal Injection called the film “A strangely inspiring story of overcoming adversity”. Film Threat wrote “There’s something hypnotic about Vincent Castiglia’s work, and Borowski does a great job of depicting Castiglia’s tragic inspirations”.